During April 2004 a salvage excavation was conducted along the southern slope of Tel Gat Hefer, in the village of Mash-had (Permit No. A-4157*; map ref. NIG 23040/73820; OIG 18040/23820) after bulldozers, enlarging a lot prior to construction, damaged a cave and a leveled bedrock surface that was probably part of an agricultural installation. The excavation, on behalf of the Antiquities Authority and funded by S. Salim Ahmed, was directed by L. Porat, assisted by A. Ben-Zioni (photography) and A. Hajian (surveying). The excavation was located c. 100 m south of the top of Tel Gat Hefer, one of the largest tells in the Lower Galilee. Previous excavations at this tell (ESI 19; ‘Atiqot 44) exposed remains dating from the Early Bronze Age to the Persian period. Potsherds dating from the Early Bronze Age to the Byzantine period were collected in a survey around Mash-had (Map of Har Tabvor  and Map of ‘En Dor :26*, Site 13). 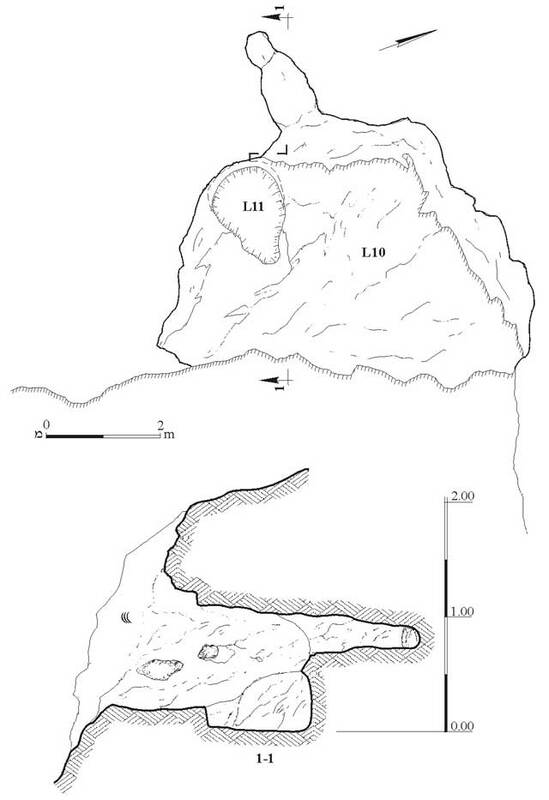 The cave was hewn in the qirton bedrock (height in south 2 m, in north 0.9 m, width 2.7–6.8 m, depth 3.6 m; Fig. 1). An irregular-shaped pit (length 1.75, width 1.3 m, depth 0.9 m) was hewn next to its northwestern wall. Above the floor of the cave and inside the pit were several potsherds, mostly of jars, dating to the Roman period.